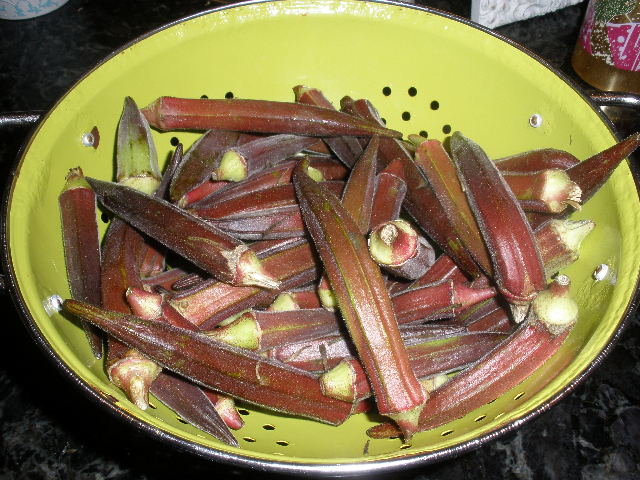 I bought a bunch of this really cool red okra last time we were at the lake, and tonight it was at the point where I either cooked it NOW or it would spoil. The guy at the produce stand in Canton told me that the red variety is supposedly more tender than green… but isn’t it pretty? YUM. I swear this is just as good as fried… especially drowned in ketchup. Brian was a huge fan. Preheat oven to 325. Combine all ingredients in a large bowl. Form into loaf and place in 1 quart loaf pan. Bake for one hour. Finally (I know! Three dishes! 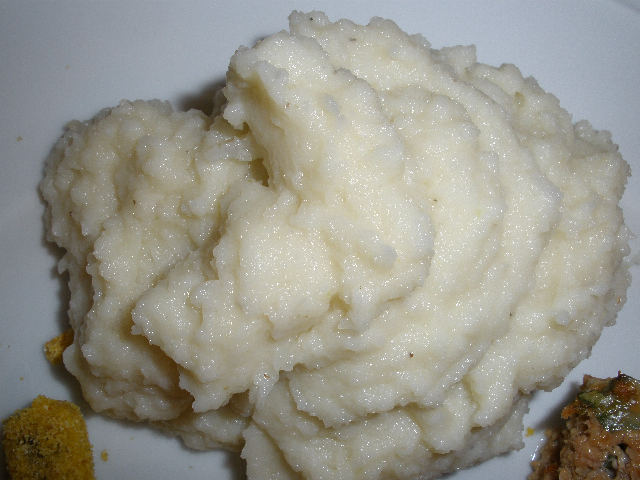 I’m like the best wife ever…), our healthier version of mashed potatoes. 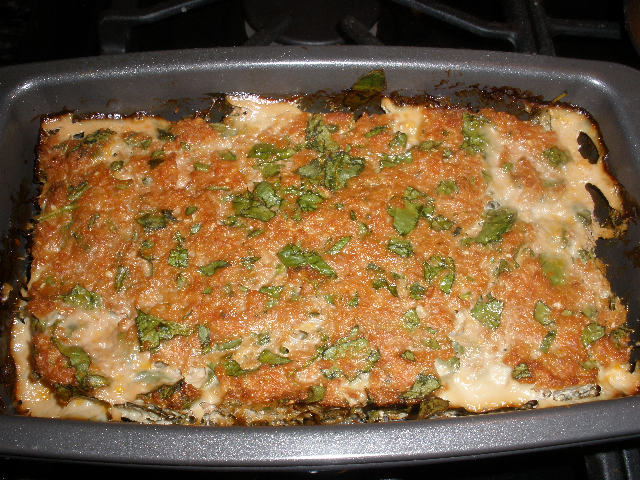 This was inspired by a South Beach Diet recipe that we’ve played around with and made totally non-SBD acceptable. I guess it’s actually closer to creamed potatoes than mashed. Just take one bag of frozen cauliflower and cook it per the package directions for the longest recommended amount of time. I steamed mine in the microwave for 10 minutes. 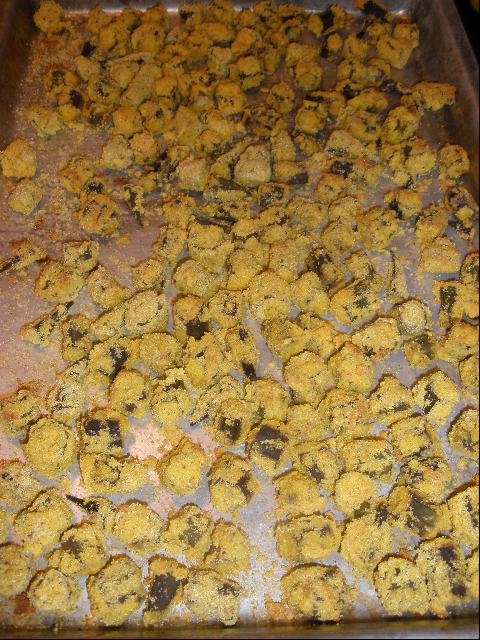 Then toss it into the food processor along with a wedge of Laughing Cow Light Cheese, a couple Tbs of butter substitute (Brummel & Brown is good), salt, pepper, and a squirt of my secret ingredient: WASABI PASTE. Then just pulse until you get the desired consistency. Try it… you will loooove this. See? Looks like potatoes, right? 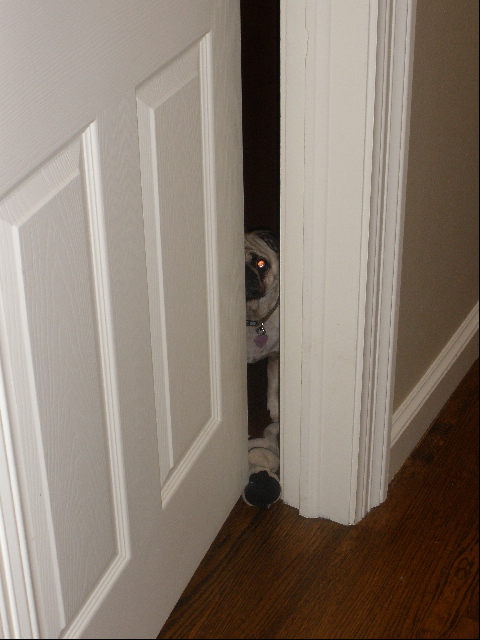 The puglet was trapped in our bedroom, along with her little protege, “Wilson”- who has been serving as our doorstop. In case you can’t tell, he’s a pug beanie baby. Chloe chewed his eyes off. Off to bed! Speedwork at 5:45 tomorrow morning- 6 x 800′s if it’s not raining. And I’m going to try to get in a little reading in bed to see what all of this Twilight buzz is about. This entry was posted in August 2008 and tagged Chloe, Okra, Recipes, Running, Turkey. Bookmark the permalink. 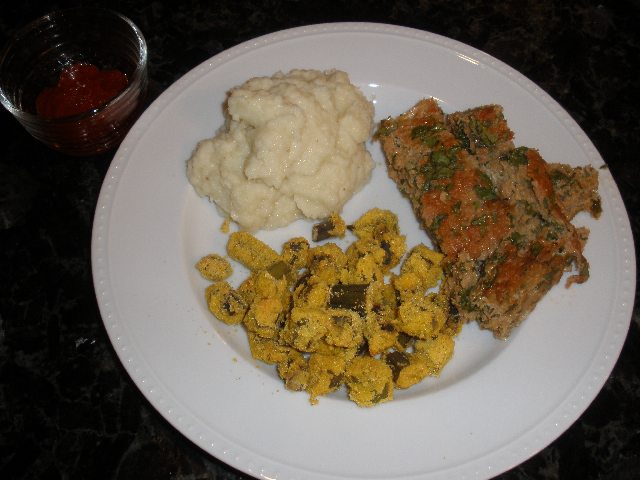 I am definitely going to give that Turkey Spinach Meatloaf a try – it combines a lot of my favorite things. You were super woman today! Great cooking skills on all items. Good luck with the speed work! I love meatloaf. Your version looks so healthy, I definitely need to try it! Oops, sorry for the extra “I” that I typed! Hi! I just saw I have “Spam” comments where your comment under the name Heather went. Interesting. Anyway, I love turkey meatloaf! So glad the okra turned out!! Yours looks excellent! I actually already own a neti pot which I did buy at WF. I used it a few times & it does work – kind of a weird sensation as you do it. Is the nasal cleanser kind of the same thing? I am glad that you got some hook-ups – enjoy! !